ICICI Direct is a stockbroker; an extended wing of ICICI group. ICICI Direct is a retail trading and investment service platform. Which has a client base of up to 20 lakhs. They offer a wide range of investment products like online equity trading, derivatives trading, mutual funds, IPO, fixed deposit, bond, NCD, wealth products, home loans, and loan against securities. ICICI group is a well-known name in the Banking sector. ICICI Bank is a foreign company that entered into the Indian market in the year 1994 in Mumbai, and it also has a wide reach all over the world. This one of the third largest bank in India in terms of assets and market capitalisation. The bank has subsidiaries in the United Kingdom, Canada, United States, Singapore, Bahrain, Hong Kong, Sri Lanka, Qatar, Oman, Dubai International Finance Centre, China, and South Africa. ICICI bank offers 3-in-1 accounts which help the clients to make their banking and trading experience hassle-free. It has a wide range of financial products like Fixed Deposits, Loans, Tax Services, New Pension Systems, and Insurance. ICICI Direct is the first broker to introduce the digitally signed contract note. Since then the process has been adapted the process of generating contract notes went up to automation which made the availability of contract notes to the customer in a safe and secure procedure through the website. ICICI Bank has about 1500 branches all over the country and evolving to be bigger day by day. Customers can Walkthrough into any of the branches for queries and support. ICICI direct have 2 brokerage plans.I-secure plan which is a flat brokerage plan and I-saver plan is a variable brokerage plan. ICICIDIRECT I-SECURE PLAN With this plan, the brokerage percentage will be irrespective of the turnover. This is suitable for regular traders who need a fixed brokerage plan. The minimum brokerage will be Rs.5 per trade or 2.5 of the trade value whichever is lower for transactions up to Rs.6364 for stocks quoting more than Rs.10. It is a variable brokerage plan depends upon the volume of the trade.High volume trades will have less brokerage and low volume trades will have a high brokerage. The minimum brokerage will be Rs.5 per trade or 2.5% of the trade value whichever is lower for transactions up to Rs.4667 for stocks quoting more than Rs.10. Brokerage on stocks quoting below Rs.10 will be levied Rs.0.05% brokerage/ share. The total brokerage in the case will be Rs.0.05% or Rs.35 subject to a maximum od Rs.0.25/share whichever is lower.statutory charges will be levied over the brokerage. ICICIdirect prepaid brokerage plan comes with lifetime validity or till the card exhausts. At the end of 15 years, any un-utilized brokerage would be refunded back to the trading account. Alike every other traditional broker and Bank ICICI direct is also termed as an expensive broker in terms of account opening charges and Demat maintenance charges. The account opening charges for a trading account will be Rs 975 but the trading account maintenance charges will be zero. In the case of Demat account, the account opening charges will be zero but the account maintenance charges will be around Rs.600. 8 Rematerialisation A fee of Rs 25 for every hundred securities or part thereof, subject to maximum fee of Rs 3,00,000 or a flat fee of Rs 25 per certificate, whichever is higher. ICICI direct benefits its customers with 3 in 1 accounts which will be linking your banking and trading accounts for easy access. 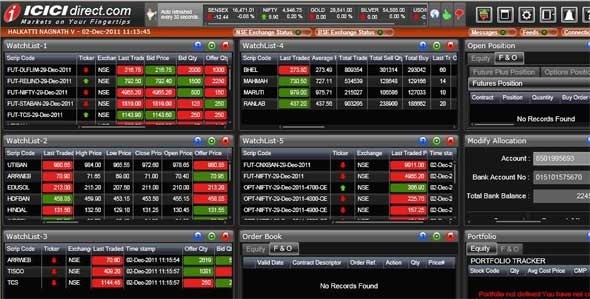 Market scanners,trend scanners and live scanners for the easy view of trending scrips in a single window. Complete control over the trades with market tracker, heat maps,Global indices moving averages ,gross delivery data,snap view,bulk and block deals. 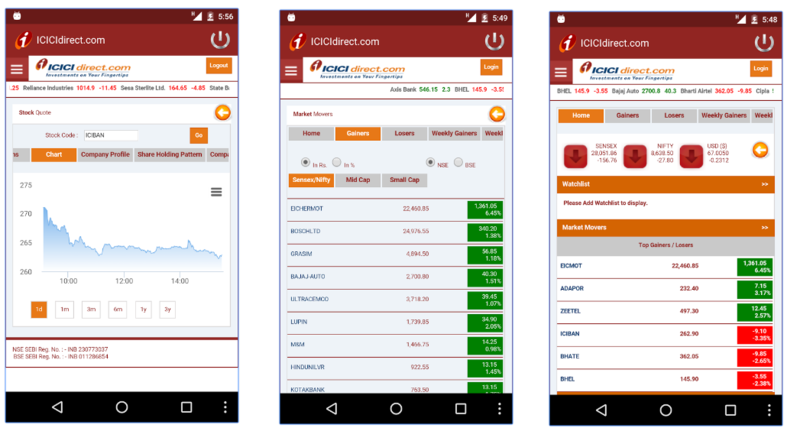 ICICIdirect Mobile Application is a Top class and one of its kind application Engraved by ICICI direct.It allows the users to tradeon the go, track your portfolio,view latest quotes, market movement and get live research calls and recommendations .It is one of the Technologically rich mobile trading platforms in India. ICICI Direct recognizes the need for financial literacy & education and has been using many platforms to increase awareness in empowering its customers to make informed investment decisions.ICICI Direct is the first brokers in India to introduce a training institute where they train on different financial subjects. Online Tutorials around basics of Equities, Mutual Funds, Options, Futures and technical analysis. ICICIdirect provides above average stock recommendations for the daily pick, weekly picks, short term, long term and also for futures and options trading for free. Customer service is rated high in the case of ICICI direct. Being a bank primarily it has a huge reach for customers whether through branches, phone banking services, email and an exclusive toll free number. They are extensively known for banking services in the first place. So the customer can be easily guided through the Hassle involved by the customer care. Call and trade number will be different for every location. ICICI direct have a special place for their customer delight. They give best investment solutions in the market but for high price and brokerage. The tips and Recommendation are accurate to the core. But there are complaints all over the www about the customer service. With a client base of 20 lakhs these complaint are said to be negligible. But you can't find the way out with your profit as there will be hidden charges every time you make a trade. You will fall in love with their trading platforms hang proof and Hassle proof. People nowadays are moving to discount brokers just to make their trades profitable with less brokerage. So it is better to opt for ICICI direct when you are super rich and don't care how much you earn and how much you lose(In the name of hidden charges and heavy brokerage).